If you are spoilt for choice about the type and brand of crutches to purchase and use for your leg injury recovery, here’s a review that clears the air about the five most sought-after models. These mid-range crutches make use of a pair of springs at their bases to act as shock absorbers whilst using the absorbed energy to simultaneously catapult you forward. The neutrally placed and padded hand grips allow the tension to be spread evenly across your palm. This reduces the strain on your wrist tendons significantly. The underarm saddles are padded and ergonomically shaped to reduce underarm abrasion and soreness when making your movements. These crutches could indeed be a good choice for you if comfort factors greatly in your choice of crutches. Furthermore, these crutches have incorporated a folding design which makes it easy to store in relatively smaller spaces. I am curious to know whether it can fit into my backpack. I’ll find out soon enough. Height and arm length are not adjustable, so you have to be really sure of your height and arm dimensions when selecting one of the two DonJoy crutch sizes available. As much as they are foldable they can’t fit into your standard backpack. There may be some noticeable wear on the tips after prolonged use. Energy conserving hence can you can walk with them for longer periods. Folding design makes ideal for the traveler and for storage as well. Strong frame as maximum weight capacity is 400lbs. This forearm crutch set features a collapsible handle design that allows you to fold them up and store them compactly in a given space. Furthermore, each crutch features cuff height adjustment at four levels. An overall height adjustment mechanism is included as well as complete with a safety clip. The grips are also surprisingly soft and replaceable as well. If you are on a relatively tight budget and are looking for an affordable, fully adjustable forearm crutches, these could be a splendid choice for you. For a heavy individual (past 200lbs), pins and upper supports may give in fairly fast. Not ideal if you are nursing a non-weight bearing injury. The collapsible handle design makes it ideal for the traveler. 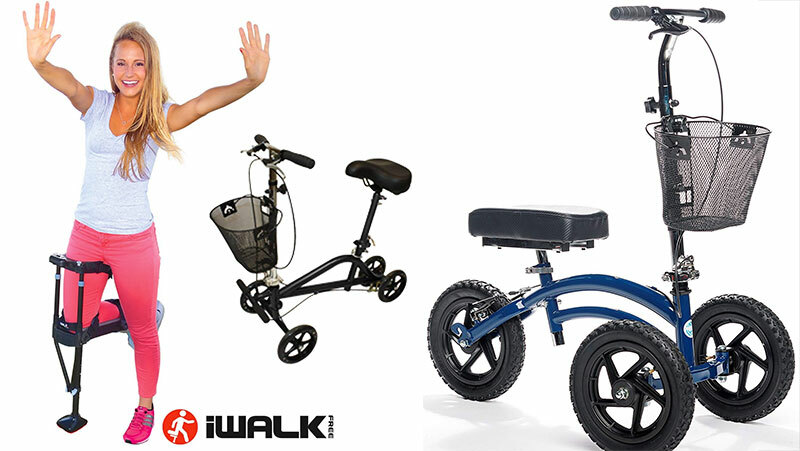 Ideal for a wide range body height dimensions as the crutch height is fully adjustable. Millennial medical crutches have a got a very sturdy build capable bearing maximum loads of up to 500lbs which could make them ideal for you if you are on the plus size side of the scale. A pair of springs has been fitted at their bases to act as shock absorbers whilst using the absorbed energy to concurrently hurl you forward. 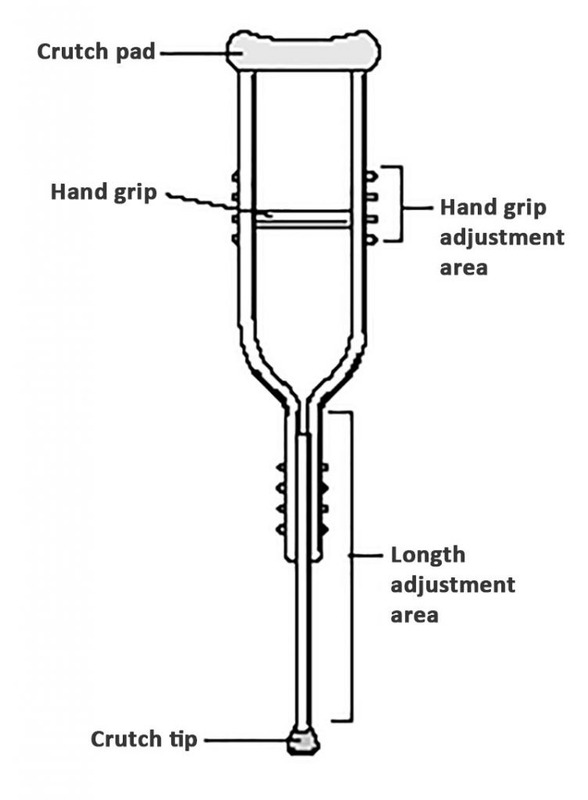 Hand grips are ergonomically designed and are placed at an angle conforming to the natural angle of your wrists. This offers superior grip comfort and load balancing. Handle, and overall crutch height is all fully adjustable. Spring assisted movement may make first-time users struggle to use these crutches. Ideal for plus size individuals. Great for travel as it the crutches are foldable. Base tips are more resistant to wear. This crutch provides an “out of the box” alternative to conventional crutches. Its hands-free operation during movement may suit you if you are nursing a long-term lower leg injury or if you are recovering from an amputation. This hands-free crutch allows you to perform other everyday duties with greater freedom and convenience whilst nursing your injury. The iWalk crutch may be a great choice for you if would like your hands to be completely independent of operating the crutch. As far as I am concerned, this may be the holy grail of all crutches. I bet I could even put my golf ball surprisingly well when I am rocking this crutch. You are incapable of bending your injured leg through a 90-degree angle. Your injury location is at the knee or above it. You had mobility challenges even before you sustained the injury. You are suffering from proprioception disorders. It may take a while before one is accustomed to walking in this crutch. The hands-free operation allows you to be more productive with your hands. You can proceed with cooking, lawn mowing, shopping, etc. 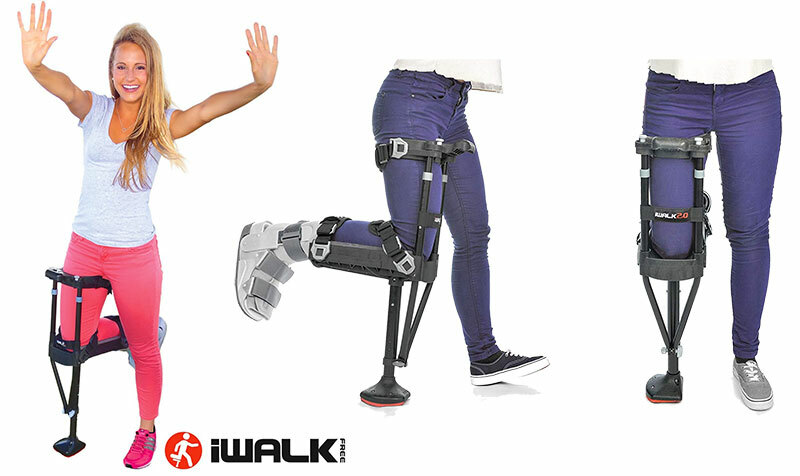 without having to worry about the crutch support and stability. You can almost achieve a normal two-legged walk. Height dimension is adjustable to a fairly wide range (from 4’10” to 6’6”). User manual for crutch assembly and proper use has been included. The arm length and height of these crutches are fully adjustable thus ensuring an almost universal fit. If your height lies anywhere within the (4′ 9″ – 6′ 4″) range, these crutches could be a great buy for you. The hand grips are covered with rubber foam, and they contour well to the inner shape of the hand. The grips are positioned to align themselves to the natural angle of your wrists and thus ensure that the tension you exert when holding the grips is evenly distributed throughout the palm. Best Crutches Reviews: Mobilegs Ultra Crutches. This could be great for you if grip comfort is up there on your list of priorities, especially if you are to be subjected to crutches for a long period of time. I had suffered a metatarsal (midfoot) fracture a while back and had to be on crutches for a long three and half month period. Due to prolonged use, the crutches I had gave me a great deal of wrist discomfort and pain. I attribute that to the hard plastic cover that the grips had as well as the uncomfortable angle at which the grips inclined. 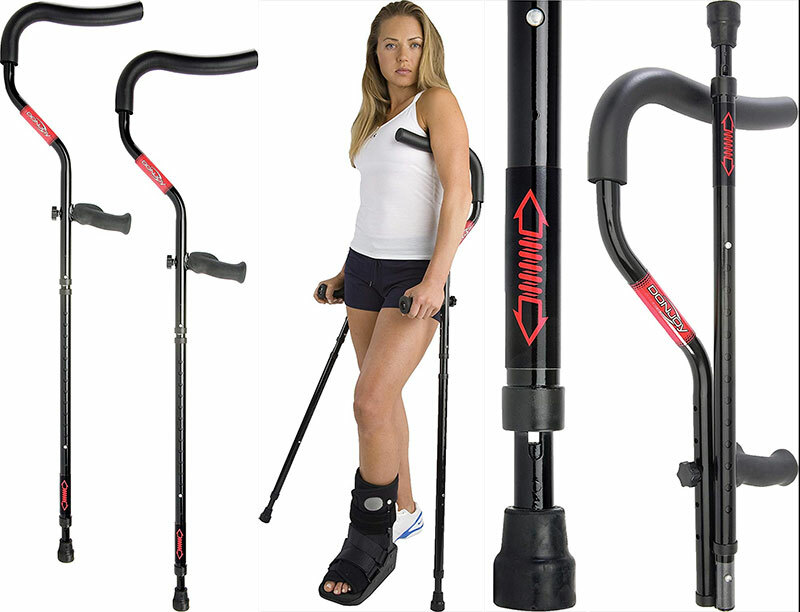 So, as far as grip comfort is concerned, you may consider going for the Mobilegs Ultra crutches. Another good feature that these crutches have is the offset at the legs which provides much-needed hip clearance and thus effectively eliminating tripping cases. Additionally, thanks to a patented design, the saddle pivots through a 360-degree horizontal plane, i.e., it can move either left, right, forward and backward based on your body movement. This provides the benefit of the crutches maintaining full contact with your underarms during movement and thus keeping underarm pain and discomfort at a minimal low if not eliminating them entirely. The underarms happen to be spring loaded as well which provides shock absorption during movement and hence boosting the overall underarm comfort. There’s a learning curve to using them. First-time users may struggle with stability due to the mobile saddles/underarm rests. Spring-loaded mounts may be noisy when you use the crutches on floors. The simplistic design doesn’t allow you to attach accessories, e.g., water bottles. Springs loaded mechanism may occasionally fail to spring back. Rocker feet provide firm ground contact and hence provide good stability. Standard Underarm Crutches, which are also called auxiliary crutches, sometimes called armpit crutches. They are made of wood or aluminum; you can easily adjust its height. Auxiliary crutches are recommended for people with a temporary injury like a broken knee or ankle. Forearm Crutches, which are also called elbow crutches. These crutches have the cuff that grips the patient’s forearm during use. And a cuff is made of aluminum or plastic. Elbow crutches are use given for people with additional body injury or weakness. The two different types of crutch have different strengths and weaknesses. These are great for long-term users, but for the short-term underarm crutches may be easier to use because it requires less strength from the user. You might wonder what type of crutches are best for you. That depends on your individual needs. But there are several other types of crutches you might want to consider. They have a bracketed handle which helps to surround the crutch’s body to distribute your weight. These crutches are foldable for easy storage and use. They also can help you relieve back pain by keeping an ergonomic stance. This option works like the underarm crutches, but they have a larger base. They distribute your weight throughout the arms and legs a bit better, and they generally give you a bit more stability when walking. These crutches allow you to strap your arm to a position on the crutches in order that the hands can rest at a certain angle on the grip so as to relieve the pressure the motions put on your arms. If you still think of another kind of crutches, I have other modern options for you. This crutch allows you to walk almost like normal, your hands are completely free, and you can even go up and down stairs yourself. The iWALKFree crutch is easy to store and bring as well. These crutches also called a knee scooter. You will use your normal leg to scoot yourself from place to place while you put the knee of your injured leg on the padded seat, directing the crutch with the handles and use ease to balance yourself. This crutch is similar to the knee walker in that you scoot yourself from place to place but with the seated scooter; you do so with a seated position. After reading through all types of crutches and alternatives to crutches, I hope you can decide which one might be best for your needs and lifestyle. Crutches of all normal types require upper body strength from the user for proper use. Your weight will be distributed throughout the entire upper body, so it requires more strength from your arm, shoulder, and chest muscles. Both underarm and forearm crutches require upper body strength, and forearm crutches require a bit more strength. If you have limited upper body strength or just want to walk like normal, you will want to try other modern options instead. If you’re new in using crutches it’s really a challenge to coordinate and balance; then you need the underarm crutches because they can be easier to master at first. But if you care about your posture or require more flexibility from your crutches, you will want to consider forearm crutches because forearm crutches can give you control over your movement and encourage good posture. Forearm crutches are often recommended for more active patients, as they allow a variety of walking styles and gaits for different terrain. Of course, you must be sure your crutches are properly fitted to you before use. If you use an improperly fitted crutch that can lead to abrasions, muscle pains, and nerve damage. In this case, forearm crutches offer a cuff under the elbow which can reduce strain and keeps some of the pressure off the wrist that making these crutches comfortable and easy to use while underarm crutches press against the side of the body when used, often leading to soreness and abrasions. If comfort is your main concern, then you should go to with forearm crutches. Whatever type of crutch you choose, be sure it is properly fitted and adjusted. You can reduce stress on your hands and sides by adding a gel crutch pad over. Be sure that the crutch tips are solid because they are very important as they help support your weight and keep your balance as you walk. You should consider about their size before buying. A larger tip tends to provide greater stability as it has a wider surface area in contact with the ground. Some crutch tips articulate to make walking on your crutches easier and faster. Other crutches feature special spring assist technology that makes the crutch to move with you and adapt to your gait. These handles offer more security and comfort to the patient. In terms of comfort, there are several crutches offer special handles with extra padding that helps reduce stress. So, be sure the crutches has a comfortable handle that will be easy for you to use a long-term. Crutches are defined as mobility aids that are provided to patients who are injured below the waist level. There have been tremendous changes that made to crutches over a period of time. Many people over the years have developed different designs which have helped many patients recover easily and carry themselves without the need of another person. Depending on the injury, the patient is prescribed a particular product that will help them move the total weight of their body without any trouble. There are different designs that are currently available in the market, and every product has its own advantage over the other. There is no competition in this field as it completely depends on the injury of the person and the time that is required to recover from the same. Provided below are a few of the important designs and their descriptions that are generally found in the market. This particular design is considered as one of the best designs available for people who are injured severely and will not be able to walk again properly. This particular design is mostly used in the United States of America, Europe, and Canada. They contain a cuff at the top which enables the wearer to insert their forearm around the cuff. The design has been the best in use for it provides complete stability and ease of operation to the wearer. Usually, the cuff is either manufactured in plastic or in metal. Though it was prescribed for people who were suffering from a permanent disability, as of late, it is being prescribed for short term recovery as it provides the best way for a person to walk without the need of help from others. Much before forearm crutches were introduced, underarm crutches provided complete support to patients who were injured below their waist level. These were usually provided to patients who are on the path of recovery for a temporary disability. This particular design consists of pads which are placed against the ribcage of the person beneath the underarm. The patient usually holds onto the grip that is provided below and is parallel to the pads. These are usually provided to patients who have a high degree of damage. They are soles which sit flat on the floor, and the user moves in the same position. They are best used to improve the walking style and also to prevent any nerve damage that can be caused due to underarm crutches. Assigning a particular crutch to a patient will completely depend on the severity of the damage that has been caused. They are considered as an important aid that is provided to a patient who underwent an accident that has made it impossible for them to walk normally. Depending on the convenience of the patient, a particular set of assigned crutches can also be changed upon request. It is most important that a crutch will provide complete support to the patient. Regular exercises and walking will have to be carried out so that the patient can soon recover from the injury. At the end, of course, that’s all about your budget. Your choice really depends on your budget. There are many products out there to pick from, and you’re almost always going to be tempted to buy more expensive crutches. To make sure that you don’t blow your budget. This is really the best deterrent! How long will you need your crutches? How many hours a day will you spend walking about with them? Is comfort an important aspect to their use? Do you know how to properly use your crutches? What activities will you be engaged in while using your crutches? Once you answer these questions, your next step is to be fitted properly for your crutches. A health care professional should help you, so you are provided with custom adjustments to suit your needs.